The presentation of the crown was attended by 16 candidates of Miss Universe Ukraine 2017, organizing committee head Anna Filimonova, winner of the prestigious titles Miss Ukraine-Universe 2016 and Supermodel International 2017 Alena Spodynyuk, leading artist of the Kiev Jewelry Factory and jewelry maker Rostislav Kitach. 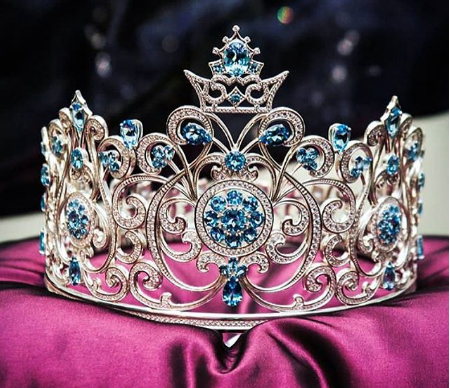 The crown is composed of 1353 diamonds and 93 topaz in different sizes and the stones are framed with white gold. Net weight of the product is 450 grams. Topaz in the crown comes from Ukraine - from the Volodarsky deposit, the age of the crystals is about two billion years. The masterpiece of jewelry art from the Kiev Jewelry Factory. Miss Universe Ukraine 2017 finals will be held on August 10.